Are you wondering how email and social can work well together? To learn how email marketing can integrate with social media, I interview DJ Waldow for this episode of the Social Media Marketing podcast. In this episode, I interview DJ Waldow, co-author of The Rebel’s Guide to Email Marketing. He’s also the founder of Waldow Social, where he consults with businesses that want to improve their email marketing. DJ also co-hosts The Work Talk Show podcast. DJ shares why you should focus on email marketing and work it into your social media activities. You’ll learn how to grow your email list using social media and get your blog readers to take action. DJ tells a story of when he heard Jeff Pulver talk about his famous quote, “You live and die by your database.” DJ explains how it’s a phrase that he probably says at least once a week. The reason it’s so important is because when it comes to marketing, email is your database. You have a virtual database of social media followers, but your database is your email contacts. Email is the glue that binds everything together. DJ doesn’t discount social media, and he uses it a lot. But he explains that if Facebook decided to change their terms of service, then the connection with your friends and followers could disappear. 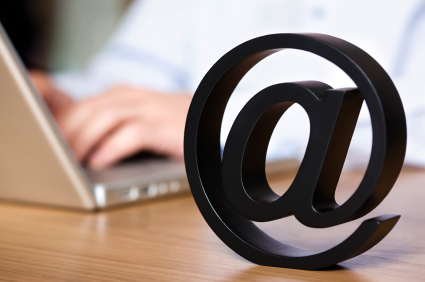 Email addresses stick with you. With Facebook, there are over 100 different email notifications. Even if you turn off most of the notifications, Facebook still messages you through email and Twitter does the same. You’ll discover how all social networks use email marketing. Listen to the show to find out why DJ encourages people to log out of Facebook or Twitter and go back to these sites for the first time. DJ explains how he has heard “social media folks” talking more about email. You’ll hear examples of how Chris Brogan and Amy Porterfield focus on how to grow their email lists. You can take the loyal followers you have on social networks and bring them over to your email list. You’ll find out the advantages of bringing your social media connections over to your email list and why it’s easier to sell via the email channel versus the social channel. Listen to the show to find out how at Social Media Examiner, we have about 500 new people every day come to our content. DJ shares how a lot happens with email behind the scenes that the average person doesn’t necessarily see. There has been innovation around filters impacting email deliverability. From a consumer standpoint, there is a new app called Mailbox that helps you manage all of your marketing messages in one place. 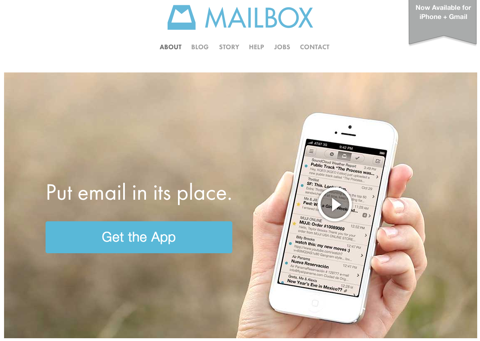 Mailbox is an app that lets you put your email in one place. DJ has started to see a lot more integration of email into social and can see it play out in a couple of different ways. One of his favorite plugins for Chrome and Gmail is Rapportive. It sits on the side of Gmail and as you hover over somebody’s email address, if that email address is used publicly to tie to different social networks, it will pull in all that information. 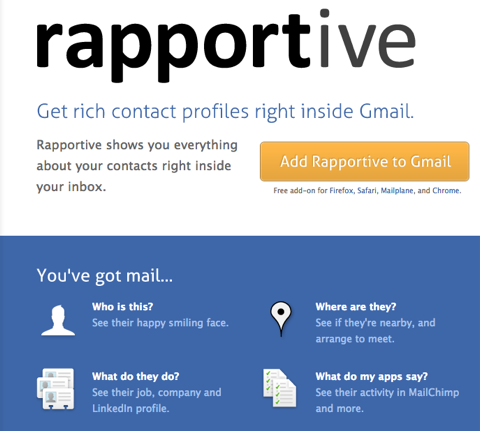 You can use Rapportive to find out information about your contacts right inside your inbox. You’ll hear an example of what information it will show about that person and how salespeople can use it. DJ explains that the advantage of this plugin is that it shows a little bit more about where he sees email going. The lines are starting to blur between social networks and email marketing. Listen to the show to hear stats from ExactTarget on the number of people who check their email on a daily basis and the number of people who prefer to get marketing-related messages through email. DJ says there are many different ways for marketers to grow their email lists using social media. At a very basic level, if you have a strong following on Facebook, Twitter or Google+, he believes it’s important to let your community know how they can get onto your list. You’ll hear DJ give examples of social updates you could use to get people onto your list. DJ also reveals how Chris Brogan and Pat Flynn get people onto their lists with the use of video. On Facebook, you can build a tab that has an opt-in form and a lot of email providers will make it easy for you to create the form directly in their system. You can then drop the code into a tab on Facebook. Although DJ has seen this work, he thinks the problem is that you still put a lot on the potential subscriber. You’ll hear what DJ recommends if someone is following you and they’re engaged on Facebook. Listen to the show to find out why DJ would rather have people on his blog than on Facebook. How can email be used to move your blog readers to action for social campaigns? DJ has tried lately to practice what he preaches. Now when you opt into his list, you’ll see automated messages as well as some more personal things. 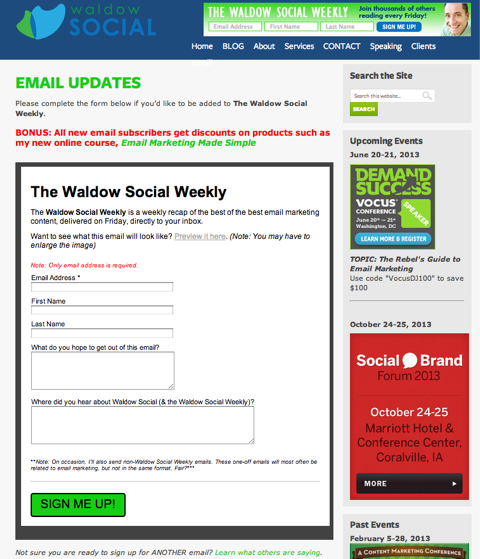 DJ Waldow's opt-in form for the "Waldow Social Weekly" newsletter. People forget that you have to build your list first, and then build trust with your audience and community. You can’t expect somebody who just opted into your list to do something for you. You have to earn that trust over time. DJ believes that a combination of both email and social can be really effective, once you have built sufficient trust. One way DJ has seen this work is to create a call-to-action link within your email. You can easily take that call to action and put a link next to it that says “tweet this” or “post this on Facebook.” Prepopulate the tweet or Facebook post with the exact message you want it to say. DJ gives an example of what he does in his newsletter and where and what your call to action should say. 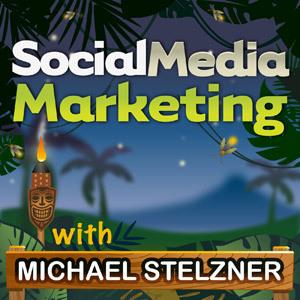 Listen to the show to hear how at Social Media Examiner, we used our email list for the launch of the Social Media Marketing podcast. Once someone opts into your email list, what is the appropriate frequency for contact? In The Rebel’s Guide to Marketing, the authors talk about the best practices for your audience. DJ advises if you start to do anything that is less frequent than monthly, your audience is not going to remember who you are. He thinks daily is great if you can manage, but a couple of times a week is probably better. You’ll discover what the sweet spot is for DJ and when he does a sales-type email. Listen to the show to find out why the frequency question is one of DJ’s favorites. DJ shares a great service that he uses called JA.TXT. It’s an SMS-to-email service, which provides you with a dedicated SMS number. JA.TXT is a great SMS-to-email service. You’ll discover how this is a great way to add email addresses to your list and why it’s really effective when you’re in front of an audience. The second service that has been effective for DJ is LeadBrite. It’s a plugin for WordPress called Welcome Gate. You’ll find out what happens when you’re a first-time visitor to DJ’s site and how Welcome Gate has helped him grow his list. Listen to the show to learn why you should give visitors an opportunity to opt in right away. 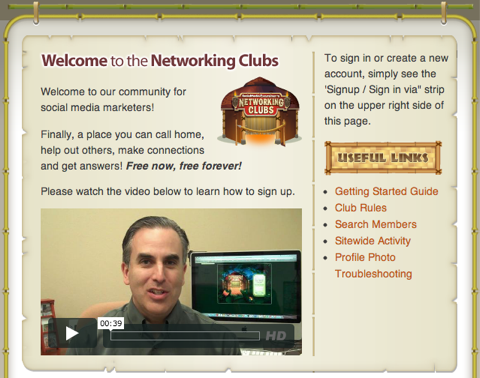 At Social Media Examiner, we have an awesome free service called the Networking Clubs. We have made a significant investment in hiring one of the best developers on the planet to put together a social network that lives independently of all of the other social networks. The Networking Clubs are a great place to connect with other social media marketers. There are almost 12,000 social media marketers who belong to the Networking Clubs. With the click of a button, you can join using LinkedIn, Facebook or Twitter. It’s a place where you can lend a helping hand, connect with your peers and get help. Each of these clubs has its own community and discussion forums. We have more clubs coming very soon. So if you’re looking for a place to connect with fellow social media marketers, you can find out more here. Also, remember you can call into our voicemail hotline and leave us a short voicemail with any question related to social media marketing or blogging. If we choose your question, we will feature it in a future episode of the Social Media Marketing podcast. Connect with DJ Waldow on Waldow Social. Listen to DJ’s podcast: The Work Talk Show. Text follow djwaldow to 40404 in the U.S. Check out The Rebel’s Guide to Email Marketing. Learn more about Facebook’s email notifications. Check out Chris Brogan‘s and Amy Porterfield‘s sites to see how they grow their email lists. Discover more about the Mailbox app, where you can manage all of your marketing messages in one place. Get Scoop for Gmail—a tool that helps manage your email. Check out the plugin Rapportive, which shows you everything about your contacts inside your inbox. Head over to ExactTarget to see the services they offer. Read this article on List Building With Social Media: How to Grow Your Email List. Take a look at Pat Flynn and Chris Brogan to see how they use video to grow their email lists. Read more on how to build a tab on Facebook. Learn more about JA.TXT, an SMS-to-email service. Check out LeadBrite‘s plugin for WordPress called Welcome Gate. Head over to Social Media Examiner’s Networking Clubs. What do you think? What are your thoughts on integrating email marketing and social media marketing? Please leave your comments below.